Flowd is a free mobile location-based social networking and communication service for music lovers. 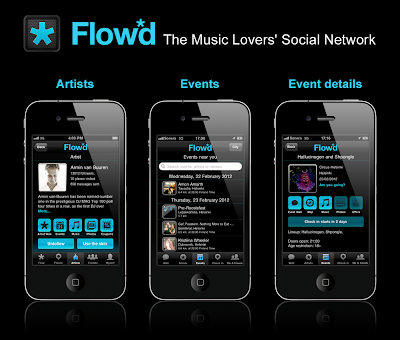 Flowd lets you chat directly to your favorite artists, find fellow fans, check into gigs and take part in promotions; get all the red-hot artist news as it breaks or simply discover new music acts. The app is available for free for Android, iPhone and some selected Nokia devices. The simplest way to get Flowd is to point your web browser to http://flowd.com. You can also use Flowd as a web service on the same URL. App visual layouts plus interaction design for Apple, Android and Nokia devices. Also graphic and interaction for the website. Designing icons, banners, leaflets, and several merchandising items.